Dasara begins today and most of us celebrate by arranging the dolls till the last day of Dasara, which is Vijaya Dashami (Vijaya means Success and Dashami is tenth day). I was looking at the photos of the past two years. 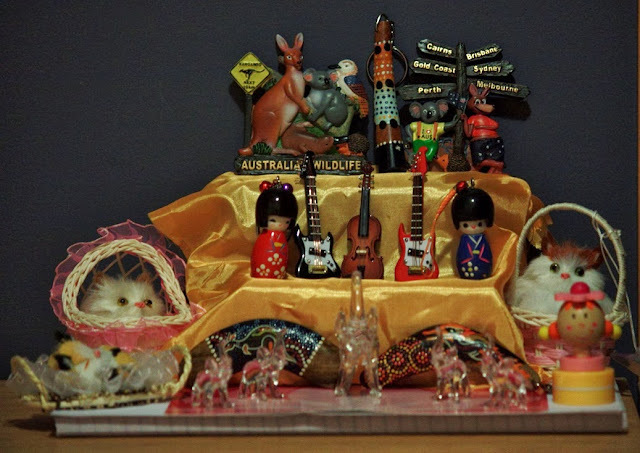 I did not want to the miss the grand festival and celebrated, by arranging the souvenirs I bought in Melbourne's Victoria Market. In the traditional Dasara dolls arrangement, the wooden couple doll is placed at the top, above all the other dolls. I bought an aboriginal wooden couple and placed it above all the other dolls. The painted masks, the peacock, turtle, elephants, fishes made out of glass, Holland's kissing couple and bell formed my Dasara 2012 dolls collection. They now are in my showcase at home in Bangalore. The beginning of Ninth year of blogging!